Earliest entries for settlement are from the 1850s when William L. Cazneau established his Cazneau Ranch here. The name was changed in 1880 with the establishment of a post office (which closed by 1884). The post office was 10 miles south of the current El Indio. The community was also known as Presidio or Indio Ranch and had a reported population of 30 in the mid 1880s. Indio Ranch became a footnote in the 1910 Mexican Revolution when Francisco Madero attempted to unseat dictator Porfirio Díaz. In the late 1920s, the 20,000 acre Indio was platted into small farmsteads in hopes of exploiting the still-under-construction irrigation system. A highway was paved to connect Eagle Pass with Laredo in the 1930s. This was to become FM 1021. The road divided and delineated the town. 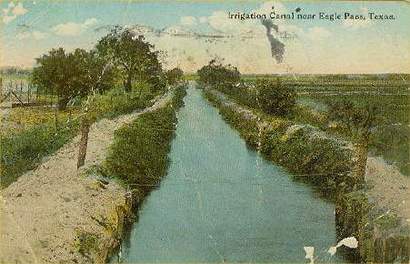 Finally, in early 1938, the irrigation canals were completed and a new post office opened soon after. The population prior to WWII was still a mere 75 residents. This grew to almost 400 the mid 1950s and peaked at 380 in the mid 1960s. It has since decreased to the present (2000) 263.